Congratulations! Yippie-Aye-Yay-Yay! Bang! 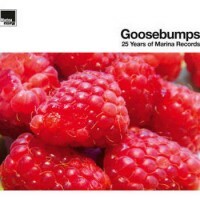 Marina Records celebrates its 25th anniversary with the release of Goosebumps, a deluxe compilation featuring 40 stunning tracks on two groovy compact discs and 3LP. Goosebumps, living up to its title, includes many unreleased cuts and exclusive contributions, as well as selected nuggets from the label catalogue. Includes tracks from SHACK, JAMES KIRK, THE PALE FOUNTAINS, MALCOLM ROSS, PAUL HAIG, THE PALE FISHERS, ALEX CHILTON and many more.. The splendid booklet features more than 100 photographs from the Marina archive. The strictly limited 3-LP edition comes with beautifully designed innersleeves and individually coloured wax. Orange - Yellow – Red. Marina Records, founded by Stefan Kassel and Frank Lähnemann in Hamburg 25 years ago, is not only known for its distinctive sleeve design which has been praised in several cover art books, but also for its eclectic, unique artist roster and its devotion to classic pop songwriting. Their fabulous The In-Kraut compilation series even turned out to define a genre of its own. Kickstarting with Brent Cash’s pop smash Digging The Fault Line, Goosebumps features artists as diverse as exceptional Glasgow funk sextet Gazelle and Chris Thomson’s beloved chamber pop outfit The Bathers from the early days of the label - to the lushly orchestrated Morricone-like soundscapes of Starless and jazz trumpeter Colin Steele, two recent signings. Steele gave the wonderful songs of The Pearlfishers the royal jazz treatment with exciting new arrangements. The Pearlfishers themselves recorded seven albums for Marina so far. Their songwriting has been compared to Paul McCartney, Jimmy Webb and Brian Wilson. They contribute the previously unreleased The Time Is Right. They also recorded a fantastic cover version of The Pale Fountains’ Southbound Excursion - under the nom de plume The Pale Fishers. Another exclusive on this compilation. The Pale Fountains themselves are featured with The Norfolk Broads – a track from their Marina anthology Longshot For Your Love. Pale Fountains songwriter Michael Head makes a second appearance with Dragonfly from the Shack album Waterpistol. Released by Marina in 1995 - and rated by many critics as one of the best British albums of the 90s. In 2001 Marina effectively initiated the reformation of sunshine pop legends The Free Design. McCarran Airport hails from their comeback album Cosmic Peekaboo. Only With You by Norman Blake of Teenage Fanclub and I Wanna Pick You Up by Alex Chilton originate from Marina’s bestselling album Caroline Now! The Songs Of Brian Wilson & The Beach Boys (“Album of the month” in UNCUT). Eccentric Orange Juice founding member James Kirk recorded his pop-tastic solo album You Can Make It If You Boogie for Marina in 2003. He joins Scottish super-group Port Sulphur on the groovy Orient Express. Felicity, one of his classic Orange Juice songs, is featured in a special, as yet unreleased “Party Mix“. Boogie! Two other Scottish music legends - both of Josef K fame - are featured on Goosebumps: Malcolm Ross and Paul Haig. Goosebumps - 25 years of pure pop heaven.